Ensures optimum grip whether you’re accelerating flat out in a straight line or cornering at high speed. When cornering, the shape of the contact patch changes, but the amount of rubber in contact with the road surface stays the same. Forces and temperatures are distributed more evenly over the contact patch thanks to the latest digital simulation softwares used in the aeronautics and automobile industry. At a very high speed, the TWARON® belt guarantees greater stability. Thanks to its variable tension, the belt grips the centre of the tread more tightly than the shoulders. Centrifugal force is thus better controlled and forces are distributed more evenly. 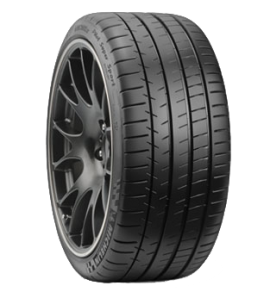 A novel distribution of 2 different rubber compounds between the right and the left-hand parts of the tread delivers maximum performance on both wet and dry road condition. Outer side: a novel carbon black-reinforced elastomer derived directly from the Le Mans 24 Hours race. This offers extreme endurance even under the tightest cornering. Inner side: the latest generation of elastomers with exceptional wet grip to mould themselves to the slightest irregularities in the road surface and break the film of water. The PSS is currently number 1 in dry handling and the fastest tyre compared to its 5 premium competitors.